A massive effort to assist the flooding victims of Pakistan. In its efforts to respond to emergency needs around the world Stop Hunger Now receives and distributes significant donations of in-kind and financial aid to our in country partners working in the areas of the crisis. Currently Stop Hunger Now is working to raise funds to support our partners in Pakistan. The recent floods in Pakistan have caused 1600 deaths and affected over 12 million people. Unlike cataclysmic disasters like earthquakes, it attracts less attention. The 2005 Pakistan earthquake killed 80,000 and affected 2 million in a 29,000 square km area. However, this flood is likely to affect more people in a larger area as the rains continue and the flood waters reaches the lower plains further South. The aftermath of this disaster could potentially result in water borne diseases like cholera, hepatitis, typhoid and acute gastroenteritis due to the contamination of the drinking supplies. Food shortages in a fragile economy dependent on foreign aid could snowball into social unrest. 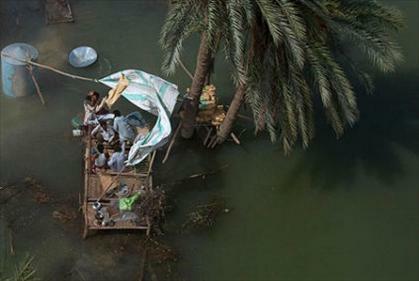 The extensive devastation of the Pakistan flood demands urgent relief. Stop Hunger Now is responding to the crisis by sending both food and disaster relief funds to our partners already on the ground in Pakistan. Please consider a donation today to help Stop Hunger Now raise $25,000 to provide aid to our partners and the people of Pakistan. Although this amount is considerable, the need for relief in Pakistan is far greater. Please join in our efforts to respond to the life threatening crisis in Pakistan and Stop Hunger Now’s ongoing work in disaster and hunger relief. Stop Hunger Now is a Raleigh-based international hunger relief agency that has been fulfilling its commitment to end hunger for over 10 years. Since 1998, the organization has coordinated the distribution of food and other lifesaving aid to children and families in more than 71 countries. Stop Hunger Now has become an international leader in humanitarian relief with the distribution of more than $56 million dollars of direct aid and more than 11 million meals. Stop Hunger Now created its meal packaging program Operation Sharehouse in 2005. The program perfected the assembly process that combines rice, soy, dehydrated vegetables and a flavoring mix including 21 essential vitamins and minerals into small meal packages. Each meal costs only 25 cents. The food stores easily, has a shelf-life of five years and transports quickly. Stop Hunger Now works with international partners that ship and distribute the meals in-country. The majority of Stop Hunger Now’s meals supply school lunch programs. Due to the ease of assembly and transport, meals can be shipped to areas in crisis. This process for distribution, through school feeding programs in hunger-stricken regions, is seen as a practical means to end hunger. • 2006 goal: 1 million meals; 1.7 million were packaged. • 2007 goal: 2.1 million meals; 3.5 million were packaged. • 2008 goal: 5.2 million meals; 5.9 million were packaged. Stop Hunger Now is a 501(c)(3) non-governmental, international relief organization based in Raleigh, N.C. It operates meal package relief programs from its locations in Raleigh, Goldsboro and Charlotte, N.C., and Richmond, Lynchburg, and Hampton Roads, V.A and Jackson, MS. There are 1.02 billion hungry people in our world today, nearly half are children. To put some perspective on this number, the tragic tsunami of 2004 that swept suddenly across the Indian Ocean destroyed more than 225,000 lives and wrecked the livelihoods of countless millions. Similarly, the “hunger tsunami” sweeps across the earth every week, killing more than 210,000 people. Every day 25,000 to 30,000 people die of starvation. As Richard Harris reported on National Public Radio, a child dies every fifteen seconds due to malnutrition, a situation equivalent to twenty jumbo jets filled with children crashing every day. Experts on the subject of hunger agree there is enough food, enough food-processing potential, and enough distribution know-how to end hunger in the world. What is needed is the political will and attention to devote the energy and resources to this important task. Stop Hunger Now is committed to hosting programs that will efficiently end hunger in our lifetime. The United Nations developed eight Millennium Development goals in the year 2000. These goals are intended to address global issues and end the main threats to human welfare to improve the quality of life for everyone in this world. It’s important to note that the first Millennium development goal is to eradicate extreme poverty and hunger. Specifically … to cut hunger in half by the year 2015 by establishing school lunch feeding programs. According to the World Food Program and Unicef, this first target is critical to all other goals. In fact, it would be nearly impossible to meet the other Millennium Development goals without addressing hunger first. Stopping hunger now, as evidenced by the millennium development goals is simply the foundation on which progress can be built. In order to succeed, in order to accomplish the big tasks, in order to reduce poverty, educate, empower women, prevent disease, prolong lives, we much end world hunger. Why is Operation Sharehouse so successful? As mentioned above, the United Nations has stated that by establishing school lunch feeding programs around the world, hunger can be cut in half by 2015. Stop Hunger Now’s Operation Sharehouse program provides these much need meals to not only crisis relief efforts but to support sustainable programs likes school lunch feeding programs, and is a fun, hands-on volunteer opportunity for caring people of all ages in churches, civic organizations, and businesses. Through the Operation Sharehouse program, our greatest dream is being realized—thousands of volunteers are learning the value of addressing hunger and are joining Stop Hunger Now in creating a world without hunger. They are taking action by volunteering to package meals and helping spread the word. The program is sustained through volunteer contributions and sponsorships amounting to 25 cents per meal, which pays for the cost of raw ingredients, packaging, and operational costs. Once the start-up costs are raised and food-packaging levels reach at least 1.1 million meals per year, the program is financially self-sustaining. Due to the valuable experience Stop Hunger Now’s Operation Sharehouse program provides volunteers, we are experiencing huge demand to establish new locations in at least four states including North Carolina, Virginia, Mississippi, Arizona and South Africa. The demand in these states comes from organizations such as churches, civic organizations, community leaders and universities. Stop Hunger Now’s vision moving into 2010 is to meet the demand we see not only from those suffering from hunger, but also from the compassionate volunteers that want to help them. Our program is a hand’s on mission project that allows organizations to work side by side in the fight against hunger. This is much more that just making a donation for our volunteers. They are able to actually participate in the assembly of the meals which gives them a true sense of involvement with the solution of providing meals to feed the world’s hungry. Alex Pollak - Program Director of Change a Nation, Inc.
Stop Hunger Now’s meal packaging program is specifically design as a hand’s on project. Groups of all ages can organize a packaging event of their own. Our Stop Hunge;r Now locations throughout North Carolina, Virginia and Mississippi serve the local community and support these meal packaging events. It is our goal to expand all across the country in order to provide the opportunity to package meals throughout the U.S.
All over the world but concentrating on Pakistan in an effort to provide relief. Stop Hunger Now has provided more than 6 million meals over the past three years to partner organizations in Haiti. Immediate relief for Haiti - 100% of all donations will support efforts for this Stop Hunger Now program.